Aged for 20 months in new oak barrels - 50% French 50% American. The “family reserve” from one of Rioja Alavesa’s most enduring family-run wineries. Wines destined to be the Reserva de la Familia label are made from a selection of grapes from old vines, those which combine a series of characteristics such as good orientation and exposure to the sun, and a poor soil which ensures low yields. This wine is one of very few Rioja wines to blend Cabernet Sauvignon with Tempranillo. 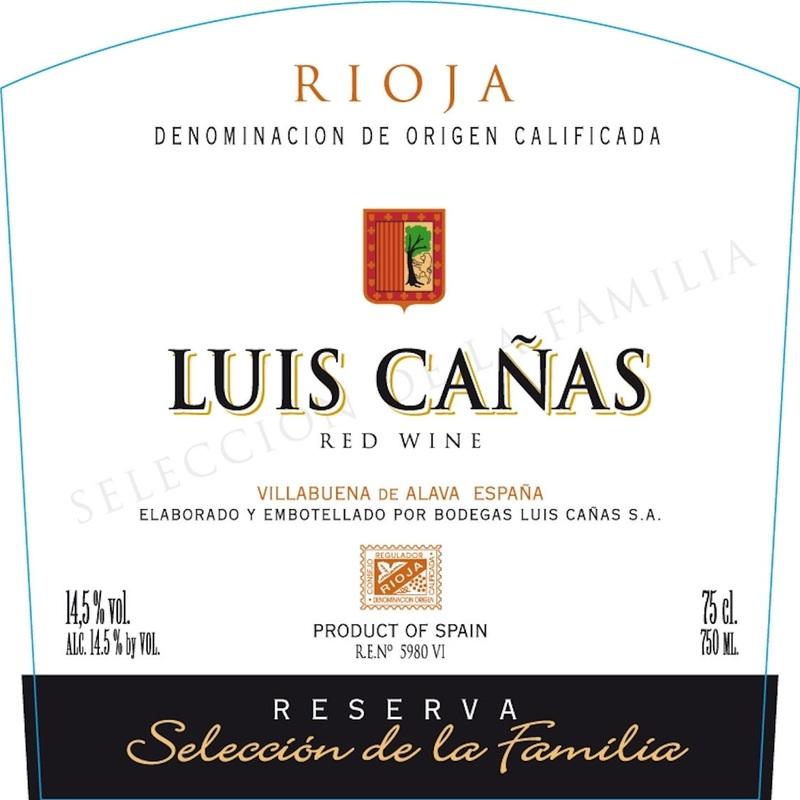 Bodegas Luis Cañas was granted permission by the D.O.Ca. to plant this variety as an experiment in the early 1980s. A brillant garnet color with cherry hints on the edges. The nose offers a complex variety of aromas that combine to bring an intense and sophisticated wine. Initially we can find very ripe berry fruits, smoky notes, raisins and liquor. After a certain amount of aeration, the cinnamon and jam notes appear and, with a little more time, the roasted and spiced aromas are noticed more clearly. The palate is full, with a good presence of tannins, although these are offset by the glycerine like character, resulting in a fleshy sensation. Long lasting and lingering finish. The grapes were cold macerated for 72 hours upon arrival at the winery. They underwent fermentation at 26º C in sealed cement tanks under constant thermal control, with the must pumped over daily. With the paste devatted by gravity, spontaneous malolactic fermentation took place after 45 days. The wine was aged for 20 months in 50% medium toasted American and 50% French oak barrels. The barrel ageing not only adds tannins from the wood, but stabilizes the wine naturally. After the final racking, it was clarified in tanks with a small amount of natural egg white, decanted after 30 days and bottled directly without any type of filtration. Because this wine’s evolutionary cycle is quite slow, only corks of the highest quality available were used to ensure that it could be prolonged for several years. "The 2012 Reserva Selección de la Familia is Tempranillo with 15% Cabernet Sauvignon, which makes it different from the majority of reds from Rioja. It matured 50/50 in French and American oak barrels for 20 months. It's slightly more international than the rest of the bottlings, the Cabernet adding some weight. There are notes of toasted sesame seeds and a touch from the French oak. It's clearly different, so it's a matter of preference which one you like best. 125,250 bottles produced. - Luis Gutierrez"
Bodega Luis Cañas is a family winery which for more than two centuries has devoted itself to viticulture and winemaking. However, it was not until 1970 when Luis Cañas first hit the market selling its young bottled wine which until then it had sold only in bulk. From this date onwards, it begins to experience a rise in sales and what is today one of the leading wineries in the Rioja Alavesa begins to take shape. 1989 marks a new milestone in the winery’s transformation when Juan Luis Cañas, the only son of Mr Luis Cañas takes charge of the same. Aged 33 , he brings fresh ideas to the table and begins to develop new wines at the same time as he promotes increasingly aged wines, beginning to lay the foundations of what would later become the new winery. -The Climate: Fundamentally Atlantic, which thanks to the protection that the Sierra Cantabria provides from the coldest northern winds as well as Continental and Mediterranean influence. - The Soil: The soil is poor and of a clay loam or chalky clay type, ideal for obtaining grapes of an extraordinary quality. - Altitude: Our vineyards are located between 450 and 600 meters in altitude. TEMPRANILLO: The most important indigenous red variety in the D.O. RIOJA. And one of the biggest varieties in the world. It produces wines for length ageing, very balanced in their alcoholic degrees, color and acidity. GRACIANO: An indigenous red variety with a great future in Rioja and so its surface area is increasing. It produces wines with considerable acidity and polyphonelic content, ideal for growing, whose aroma is superior in intensity to the rest of the Rioja verities. A perfect complement to the Tempranillo for ageing. VIURA: The most extensive white variety in Rioja. It produces fruity wines, with a floral aroma and a notable degree of acidity, ideal for preparing both young white and vintage wines. The vineyard is the star of a landscape where the plots of land, mainly located on slopes and terraces, being protected to the north by the imposing presence of the Sierra Cantabria. Villabuena is a town located to the south of the province of Álava, where the city of the vineyard and the preparation of wines is practically the sole activity that is carried on. It is in this region of Rioja Alavesa where the most suitable conditions arise for obtaining large vineyards of a superior quality. 22 hectares of vines of over 60 years of age and 30 hectares of between 30 and 60 years make up a vineyard which is the strongest indication of the wine cellar. The old vineyards achieve a perfect balance given their low production level, having very deep roots that offer the wines complexity, minerality and personality as well as making them more resistant to drought. Vines that are checked and run by the agronomic engineers from our field department in which rational wine-growing that is respectful of the environment. All of the forms of treatment that are carried on at the vineyard are restricted to minimally aggressive products and methods which include amongst others, the prohibition against the use of herbicides and the use of fertilizers that are always organic. The purpose is to make use of a vineyard with a powerful defensive system that is capable of being defended from external threats with no need for artificial assistance. In this way we achieve complete respect for the land. The native soil is a fundamental part of the distinguishing personality of each region. We also manage to make the vines healthier. The Pago de Carraovejas Ribera del Duero 2015 vintage marks a turning point in the history of the winery. From now on, the Crianza and Reserva are unified in this wine that focuses on the terroir and character rather than the time of aging. Its renewed label reflects the three key elements of this red: origin, soul and emotion. As Pedro Ruíz, the owner says - "We have been working intensively in the area for years and we feel that our vineyard has reached an extraordinary maturity stage. The 2015 vintage, tasting after tasting, showed a clear increase in concentration and expression, as well as the freshness and elegance that we were looking for. It was the moment". Made from 90% Tempranillo, 6% Cabernet Sauvignon and 4% Merlot, aged in oak barrels for 12 months, the wine offers floral notes, blackberry and blackcurrant aromas, hints of spice. Round, silky and flavorful on the palate, soft tannins, and a significant aging potential. Pago de Carraovejas Crianza Ribera Del Duero is made with grapes grown in the Botijas River valley, and planted between 1988 and 2011. Our work over the last 30 years has been geared to handcrafted viniculture, that puts as much care as possible into the microclimate conditions and the details. We have placed particular attention on the maintenance of the soil by plant cover that already grows spontaneously. It allows us to develop the ecosystem of the valley, which we respect scrupulously, using organic fertilizer and sulfur as the sole basis of our viticulture. Depending on which plot they come from and the time they enter the winery, the grapes may be deposited in cold chambers to prevent oxidation and preserve the aroma. We carry out a two-part selection: first on the vine, where we choose the bunches, and then on a belt in the winery, where we remove the grapes that do meet the necessary conditions. The grapes enter the winery and are transported with the assistance of gravity. The deposits are filled slowly and gently. Depending on the characteristics that we detected when tasting the grapes, we ferment them either in stainless steel deposits or French oak barrels. For years we have worked with our own yeast that has been isolated from the vines by our team. This work is also partly responsible for the Carraovejas character. The wine was aged in barrels for around twelve months. A deep powerful Gran Reserva from one of Rioja Alavesa’s most enduring family run wineries. The hillside terraced vineyards are sheltered by the Sierra Cantabria Mountains to the north from harsh weather extremes. Small plot production is utilized in this region of infertile chalky clay soil to produce clusters of excellent quality. Almost 900 plots are needed to complete the approximately 400 hectares of estate-owned or cellar-controlled vineyards, some with vines more than 100 years in age. Rich ruby red color. Intense and concentrated on the nose with warm, fresh notes of chocolate and cocoa. The barrel is present with notes of toasted wood, peat and smoke with spicy and black fruit touches. It is potent on the palate and shows nerve and good structure, an expression of wines from great vintages. A black cherry color with intense violet hues. Aromas are dominated by ripe red fruits, minerals and blue flowers. Fine, concentrated and exquisite on the palate, it is fleshy, fragrant, and full bodied. Ageing: 2 months in stainless steel tank and then 2 months in the bottle. "A silky texture carries harmonious, if somewhat muted, flavors of red plum, tobacco, sage and mineral in this focused red. Light, well-integrated tannins and lively acidity give this balance. Should bloom in a year or two. Drink now through 2024. 1,500 cases made. – T.M." The colour is intense, purple-tinged garnet. The aromatic range of the nose goes from fresh berries to black fruit (blackcurrant, blackberry). The palate is full-flavoured, with very soft tannins and aromas of the fruit already mentioned. This is a gorgeous style of wine, fruity driven, for every day drinking...anytime ! The wine is produced from hilly vineyards that are mainly planted on sandy and clay soils. They are located on the East side of the Rhone valley, in the Vaucluse area. Welcome to the foothills of the well known “Mont Ventoux” Mountain. Stainless steel fermentaion at cool temperature to preserve the fruits and typicity. Bottling 8 months after the harvest. Goes well with quite a lot of food such as Pizza, Pasta, hamburger, mild cheese or even on its own.